The work I do requires that I be able to see very fine details - pivots as they are being stoned and burnished, pallets as they are being dressed, the condition of the inside of pivot holes, honestly, the list goes on and on. Virtually all of the work I do on the jewelers lathe or my small Swiss mill is done while looking through a binocular microscope. Early in my clock and watch restoration career I was lucky enough to find one of the scopes shown below. These scopes were developed for ophthalmic surgery. I find them to be the most effective option available for doing clock and watch work. Their big advantage is their very well made and stable articulated arms. I have one on every bench in my shop, ready to be pulled down and use. These scopes can be purchased with 6X, 10X, 15X, or a combination of optics. I recommend the 10X for most work. 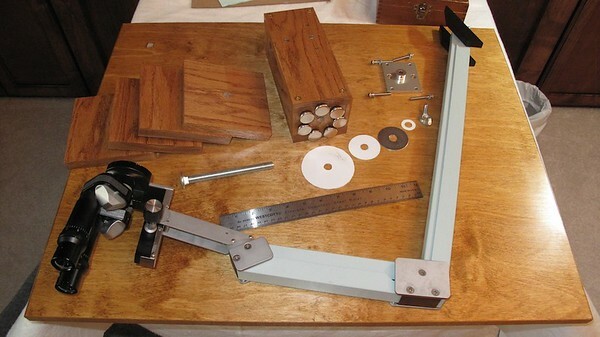 One of the following pictures show how the mount is clamped to the bench. These scopes also came with a floor-mounted base – with castors. Sometimes I have one of the floor bases in stock. They are heavy, so pricey to ship. If you would like to read an article that I wrote on the various options for seeing what you are doing when doing clock and watch work - check out this article: To See Or Not To See A watch restorer who bought one of these scopes wrote: “This is just a short note to thank you for extending my watch repair life. You sold me a scope a couple of months ago, and it is everything you said it would be. I am once again enjoying my life long hobby of watch repair.” Another gentleman wrote: "I have found using the microscope I purchased from you, one of my most valuable tools in my shop!" I wish I could say I had lots of these scopes for sale. I did, before I wrote Tid-Bit 14, but they are all went quickly. These scopes cost around $800 to $1,000, depending on the specifics of what you would like to have. Right now I have 2 scopes that are available for sale - please give me a call and let’s talk about what I have in stock.